Casano, L.M., del Campo, E.M., García-Breijo, F.J., Reig-Armiñana, J., Gasulla, F., del Hoyo, A., et al. 2010. Two Trebouxia algae with different physiological performances are ever-present in lichen thalli of Ramalina farinacea. Coexistence versus Competition? Environ Microbiol 13: 806–818. Guzow-Krzeminska, B. 2006. Photobiont flexibility in the lichen Protoparmeliopsis muralis as revealed by ITS rDNA analyses. The Lichenologist 38: 469. Kroken, S. & Taylor, J. 2000. Phylogenetic species, reproductive mode, and specificity of the green alga Trebouxia forming lichens with the fungal genus Letharia. Bryologist 103: 645–660. Leavitt, S.D., Nelsen, M.P., Lumbsch, H.T., Johnson, L.A. & St Clair, L.L. 2013. Symbiont flexibility in subalpine rock shield lichen communities in the Southwestern USA. The Bryologist 116: 149–161. Muggia, L., Pérez-Ortega, S., Kopun, T., Zellnig, G. & Grube, M. 2014. Photobiont selectivity leads to ecological tolerance and evolutionary divergence in a polymorphic complex of lichenized fungi. Annals of Botany. 114: 463–475. Romeike, J., Friedl, T., Helms, G. & Ott, S. 2002. 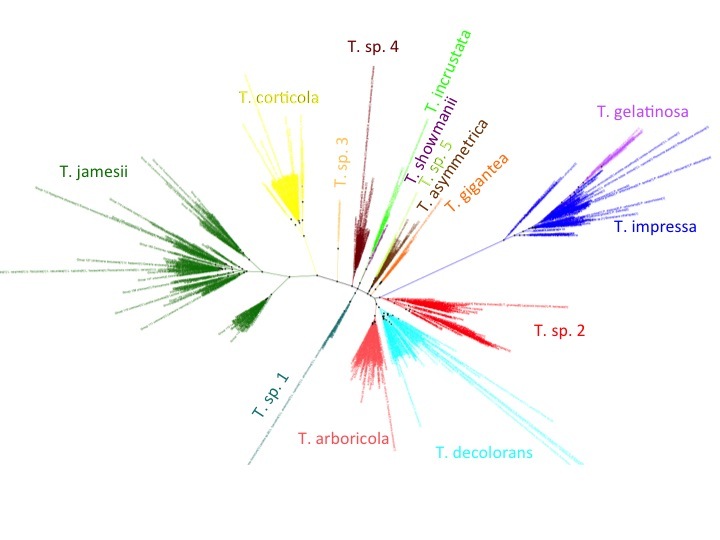 Genetic diversity of algal and fungal partners in four species of Umbilicaria (Lichenized Ascomycetes) along a transect of the Antarctic peninsula. Molecular Biology and Evolution 19: 1209–1217. Ruprecht, U., Brunauer, G. & Printzen, C. 2012. Genetic diversity of photobionts in Antarctic lecideoid lichens from an ecological view point. The Lichenologist 44: 661–678. This entry was posted in Green Algal Photobionts, Uncategorized and tagged ITS, Trebouxia. Bookmark the permalink.